Afrika Tikkun, established in 1994, is a non-governmental non-profit organization that works toward the transformation of South African communities by caring for vulnerable children and orphans in townships, from infancy to 19 years of age. The focus is on providing a HELPING HAND rather than a HAND OUT. 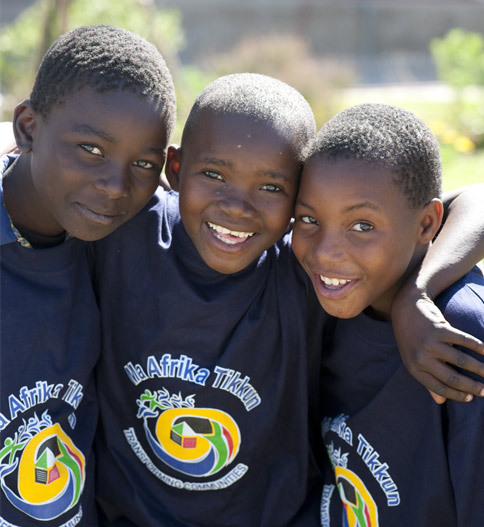 Afrika Tikkun supports more than 18 000 children a year. Afrika Tikkun’s Chief Patron is Mr Nelson Mandela. Afrika Tikkun is a registered Black Economic Empowerment company with level 2 rating. Mr Nelson Mandela, has hailed the Afrika Tikkun programs as a ‘MIRACLE’. “The Afrika Tikkun project demonstrates in a practical and sustainable manner what can be done with limited resources, great commitment and passion. The challenge to reach all the disadvantaged people of South Africa remains a paramount one. It is my belief the Afrika Tikkun represents the best of what civil society can offer in partnership with Government’s considerable efforts. I would be pleased if Tikkun, through the right levels of support, were to strengthen its efforts to continue its valuable union.” - Nelson Mandela.